As I was cleaning in my workroom I ran across a can I had saved. Yup, you will find some interesting and odd things in my workroom! I don't like to toss things out that I think I can use. Recycling is always a great thing and I will often use things like cans, jars and containers at least one more time before I put them in the recycling bin. And yes, I am aware that when I put them in the recycling bin they get made into new stuff. But I am just prolonging the process for the item I'm keeping!!! The item I kept this time was a short tin can. I think it contained water chestnuts. Those cans are always nice to use because there isn't anything stinky in them. I do wash them in the dishwasher but sometimes I think some things (especially things with garlic) have smells left behind. To decorate my can I just wrapped a piece of decorative paper around it to see how long and wide I needed to make it. I cut the paper to fit and glued it in place. I don't like to use tape on these because the tape leaves the paper with a texture where it is set. Glue dries thin, plus I take a bone folder and slide it around the can to spread any thick spots of glue and to just even out everything. And I set it aside to dry. I moved on to the lid. I made a round circle for the top of the can. I cheated a bit here. I used a piece of white label and punched out a big circle and stuck it on top of the lid. Then I made the flower. I used the Daisies #2 die. I cut two of each piece and glued them together. I punched out an Old Olive circle and glued that in the center. I stuck the flower in place using a pop up glue dot. 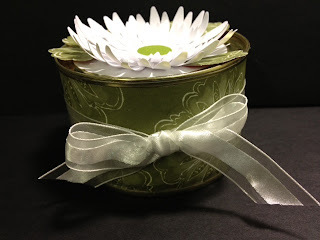 Then I used the new blossom punch and the decorative paper matching the paper around the can and cut one flower out to cut up to use as leaves. I glued them in place. To finish up the can I tied a piece of ribbon around it and added a tiny glue dot under the knot of the bow to hold it in place.﻿ That was it. A very easy and quick gift to make. This is something even the kids can help with. A note about the lid of the can. The can was opened with a European can opener. They open on the side edge instead of the top. When you are done with your decorating you can add some candies and then take some crazy glue or Crystal Effects and glue the lid on. It is now ready for gift giving.